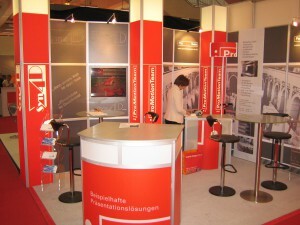 The preparation for an artistic exhibition and a commercial Trade show has some similar process. The preparation and the correct identifying target is the basis for the success of the presentation. Presentation is visual and none visual communication. There are no Exponates in empty space. They are placed in a story, context, and environment and in the perception of people. In 1988 D.Ohlmann collected a group of oversea Students in Liverpool around him, calling themself artBridge. 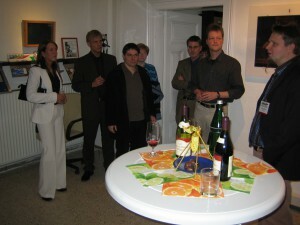 This group organized national and international exhibition and exchange of art between nations. The first exhibition has been organised by the oversea Students of Hope Street University and the Art-college from the Polytechnic Liverpool in 1989. Later Dietmar created an exchange between the RCA London and the HBK Braunschweig. For the Expo 2000 in Hannover, D. Ohlmann worked the communication and coordination of displays for a Project in Wolfenbüttel, the Staatsarchiv and Herzog August Bibliothek (Dr Jarck). In 2000, he created artBridge, an online magazine, contributing to a new network of information. Since then, artBridge’s involvement has developed a rare collection of information in the field of the art and media photonics. The research papers, art critics, reports, interviews here listed, have been produced from insiders, artists, scientists, educators, willing to transmit their experience. Over the years they represent a real source of inspiration. Editor of the magazine and education programs were conducted by Odile Meulien, former director and curator of the Art, Science and Technology Institute of Washington DC. artBridge provides special consulting about information on artworks, techniques and their creators for museums and institutions. In 2005, O. Meulien and D. Ohlmann co created the Syn4D GmbH, a creative design center to develop and distribute a new form of synthetic digital holographic printing technology. One major project has been to introduce the knowledge of new media technology in education, from children (school classes), professional (architects and automotive) to university and research center (DLR Adlershof). Both conducted exhibitions, lectures, workshops and designed exhibit pieces for trade shows, museum and cultural centers. DLR: The German Aerospace Center (Deutsches Zentrum für Luft- und Raumfahrt) is supporting research and educational programs on a high level. From Stereo recording to holographic 4 dimensional presentations we developed here innovative displays. HHI: The Fraunhofer Institute does research in new product and application of new technology. In cooperation with them, we have been looking for a new holographic presentation. IAV: Automotive research and design. One picture says more than thousand words. The holographic video we have developed says more than thousand books. Human is a creative identity. We produced sound, images, movement, smell and tactile Experience. Under the hand of craftsmen a piece of wood becomes from hard and rough to smooth and soft. Whatever we do create, its reason is a thinking mind.